The Vancouver Canucks are interested in making a trade for forward Micheal Ferland. The Province: The Vancouver Canucks are looking to add a top-6 winger with some toughness to their roster. The Canucks feel Carolina Hurricanes forward Micheal Ferland would be a perfect fit. It’s pretty clear he’s not going to re-sign with the Hurricanes, despite the fact he’s in the midst of a second-straight season of solid second-line production. Ferland, 26, carries a very affordable $1,750,000 cap hit this season. 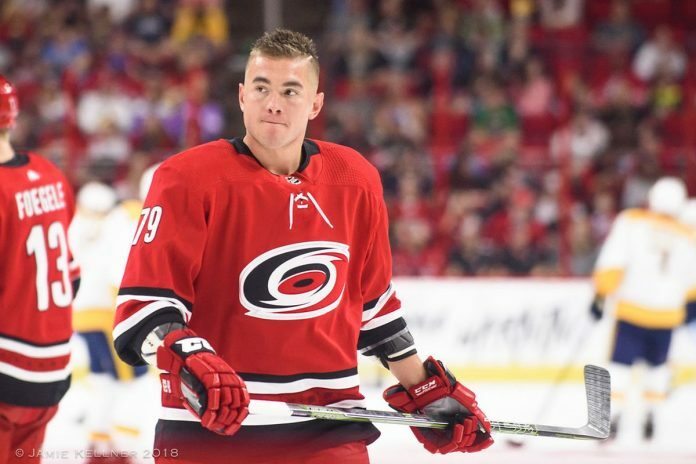 Trading for him is no guarantee he’ll stick around, unless you offer up more than he might expect to make on the open market as Ferland will be a unrestricted free agent this summer. GM Jim Benning has said, he’s not moving one of the handful of prospects he has. The Canucks can’t really afford to let any young players of promise go, given they’re not bursting at the seams with them. The Canucks could offer Alex Edler or Chris Tanev. Nikolay Goldobin may have some appeal in a trade, but again, he alone isn’t bringing back Ferland. The Fourth Period: Ottawa Senators forward Ryan Dzingel is getting a lot of interest from other teams.